Read the headlines or watch the news and you're sure to get depressed. The world is falling apart. Anger, violence, and mayhem seem the norm everywhere. And the abuse of our fragile home -- planet earth -- is clearly on an unrelenting path of self-destruction. But is this a true picture of the state of the world or a reflection of the media's entrenched dictum: "If it bleeds it leads"? 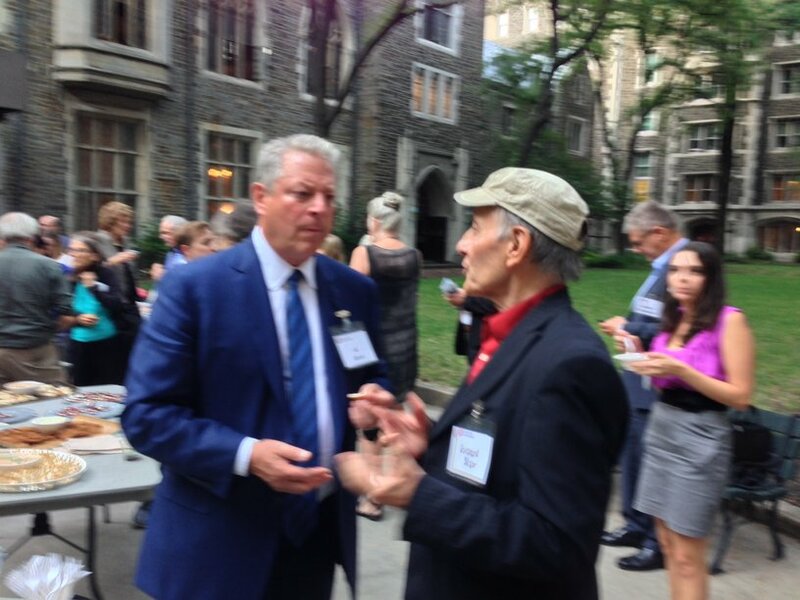 A more hopeful landscape was portrayed by former Vice President Al Gore at the "Ecology, Economy, and Ethics" Conference at New York City's Union Theological Seminary on September 16th. In contrast to the gloom and doom scenarios, Gore and others reported on significant progress in addressing climate change by individuals, governments, and corporations. While we have a long way to go to slow the progress of impending climate-related disasters, a rising global consciousness suggests that we may ultimately meet the challenge. In listening to, and in conversation with Al Gore, I was impressed by his passion for awakening the world to the threat of climate change. He continues to work tirelessly with world leaders, business executives, and policy makers. He also gives seminars in many countries for climate-change advocates and activists. No group of interested advocates (or deniers) is too small for Al Gore to show up. Even more encouraging, at the recent Clinton Global Initiative held at the Sheraton Hotel in N.Y.C. (September 26-29), I heard presentation after presentation by individuals and groups from around the globe giving selflessly and enthusiastically to projects and businesses they have initiated to address poverty, disease, education, climate change, and more -- programs that are uplifting the lives of millions of people, often in some of the remotest and forgotten places. But still, what about the other side of the coin? Has evolution failed us in favoring destructive tendencies, or not advancing fast enough to create a truly civilized species? In his book Does Altruism Exist, evolutionary biologist David Sloan Wilson has good news. As with all aspects of evolution, time is crucial. And Wilson sees a positive trajectory of evolution that favors altruistic social groups over destructive ones. While natural selection favors survival of the fittest for individuals, on a group level natural selection favors processes that altruistically serve groups or the whole of society, according to Wilson. His insights give hope that societies, despite destructive manifestations, are moving decisively toward global harmony and oneness. At the same time he is not blind to the obstacles that stand in the way of meaningful progress. A recent article embraced Wilson's optimism. The authors pointed to the principle of altruism evidenced in an action program for planetary harmony that transcends religious, ethnic, and ideological differences and embraces the sacred principle of oneness. They noted, as well, that the United Nations' millennium goals embrace similar principles of harmony. 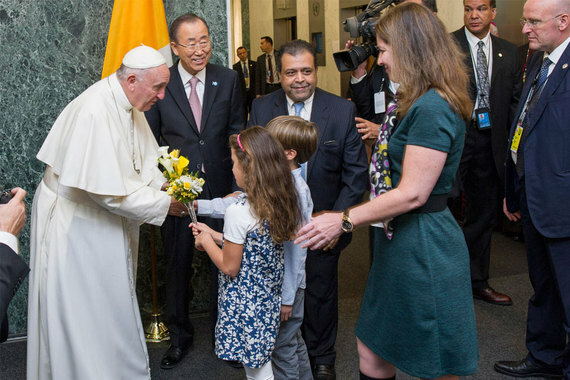 The Sustainable Development Agenda adopted by the United Nations is in tune with Pope Francis' recent Encyclical Laudato Si'-- as is the Parliament of the World's Religions conference in Salt Lake City this week (Oct. 15-19), which will feature dozens of sessions on the role of world religions in addressing the issues of sustainability and our planet's fragile health. We last wrote about David Sloan Wilson's argument in Does Altruism Exist? that at the group level evolution selects structures and processes that serve the well-being of the whole. He expands on the premise that "selfishness beats altruism within groups, but altruistic groups beat selfish groups." He gives attention to groups that functionally become higher level organisms. For example, bee colonies operate as super-organisms and have achieved biological success in this way. Wilson observes that major evolutionary shifts, such as from bacterial (prokaryotic) cells to nucleated (eukaryotic) cells occur rarely. The emergence of human beings was one of those shifts, one in which values and culture became determining modes of behavior and evolutionary success. For example tribes that prized valor, courage and self-sacrifice triumphed over tribes with lower levels of social values. He changed the definition of altruism from a focus on other-oriented motives to a focus on functional group behaviors. Altruism understood this way is a key aspect of human group fitness. For humans today survival or flourishing as individuals is dependent on group flourishing. Our individual fates depend on group fitness, and not simply group fitness in a tribal sense but group fitness on a global scale in interaction with all other life and life systems. Given this, it's not surprising that Wilson ends his book with a chapter on planetary altruism. Earth may also be seen as a higher level functioning group as was proposed in James Lovelock's and Lyn Margullis's Gaia theory. On an even broader scale classical and indigenous cosmologies and new post-modern cosmologies based on evolution and the universe story understand group development within a value-laden cosmos. Group survival/fitness/flourishing depends on altruistic functioning within this larger system. Two important contemporary sources for this are the works of Thomas Berry and Alfred North Whitehead. In the latter half of the 20th century, global institutions came into being offering new platforms for group fitness on the planetary scale. Some, such as the UN, have advanced altruistic interests, others have advanced group selection based on selfish interests of wealth, power, greed, and consumption, or ethnic, creedal or class interests. The atrocities of terrorists may illustrate Wilson's hypothesis that within groups selfish interest may prevail, but in the context of a planetary society, groups that advance well-being of the whole may prove to be more evolutionarily fit. News media fixed on the sensational, controversial and disruptive may miss important movements to planetary fitness. One such great movement occurred on September 25, 2015, at the United Nations Sustainable Development Summit when the 193 member nations adopted "Transforming Our World: The 2030 Agenda for Sustainable Development (TOW)," along with its 17 Sustainable Development Goals (SDGs) and 167 Targets, as the global development agenda for 2016-2030. Its significance can be understood in the context of the events that led up to its adoption. The UN began in 1945 in the aftermath of two world wars and a great depression. At its inception the UN attended to social, peace, justice, and human development issues, but not to the natural environment. In the 70 years since the founding of the UN great social, economic and technological advances were accompanied by decline in the natural environment. Beginning with the UN Conference on the Human Environment held in Stockholm in 1972, which gave rise to the United Nations Environmental Program, the UN has addressed human development in tandem with the environment. With the adoption of the Report of the World Commission on Environment and Development (commonly called the "Bruntland Report") in 1987, "sustainable development" became the working term for integrated development of three pillars: economic, social, and environmental. At the First Earth Summit held in Rio de Janeiro in 1992, the UN adopted Agenda 21, its first global development agenda. This important and still relevant document, overwhelming in its thoroughness at 284 pages in length, was only partially implemented. Out of it came, among other things, the United Nations Framework Convention on Climate Change, the Convention on Biodiversity, and the Commission on Sustainable Development. Following the UN Millennium Summit of 2000, the UN adopted its next global development agenda, the Millennium Development Goals (MDGs). The MDGs aimed at improving the social, economic and health conditions of the poor and the weak with one of its eight goals devoted to environmental sustainability. There are 29 numeric targets under the MDGs to be achieved by 2015--one example is to reduce childhood (under age 5) mortality by two-thirds, without specification of how the targets were to be achieved. The SDGs in sharp contrast address goals for development in both rich and poor countries. Inequity is no longer seen as a difference between the Global North and South but as a phenomenon within as well as between nations. The SDG on sustainable consumption production and consumption applies even more to rich countries than poor. Eradicating poverty was one of eight goals in the MDGs; in the SDGs there are eight goals addressing poverty with great specificity. Measures of success are no longer based on per capita GDP, but on the availability of clean water, modern energy, full employment, infrastructure, and equity. Ensuring environmental sustainability was one of eight goals in the MDGs, in the SDGs there are five goals addressing the health of seas, desertification, forests, land degradation, sustainable cities, and more. Inclusive economic growth remains a goal in the SDGs but it is always placed in the context of sustained, inclusive and sustainable economic growth with full employment and decent work for all. It is economic growth that recognizes social and ecological limits and imperatives--it is "grown-up" economics. Pope Francis in his opening address to the UN Summit warned against "declarationist nominalism" (declarations without teeth) to assuage conscience rather than serve as a means for concerted and consistent action. He affirmed the United Nations as an international juridical framework and the adoption of the SDGs as a sign of hope. We now have a worthy global development agenda for group fitness in the planetary phase of human development." Rick Clugston, PhD, is Director of Development at the Center for Earth Ethics and co-editor of Ethics, Spiritual Values and the New UN Development Agenda. Herman Greene, PhD, is Director of the Center for Ecozoic Societies and author of The Promise of Ecological Civilization [forthcoming]). Kurt Johnson, PhD, is an evolutionary biologist and specialist in comparative religions; he is co-author of The Coming Interspiritual Age.